Recently, someone on our floor at work went to a far off land and brought back a box of dates. (You’ll remember that the boxes of Turkish Delight are brought directly to my desk.) After watching them go untouched for a few days, I took it upon myself to bring them home for a baking project. The result was a date nut bread, which my boss told me it was “the best one she’d ever had”. The New York Times apparently agreed; the title of the recipe is “An Incredible Date Nut Bread”. The recipe calls for pouring boiling water over baking soda, and then pouring the mixture onto the pile of chopped dates and raisins. When The Essential New York Times Cookbook editor Amanda Hesser found this recipe, she wrote food scientist Harold McGee to get his take. 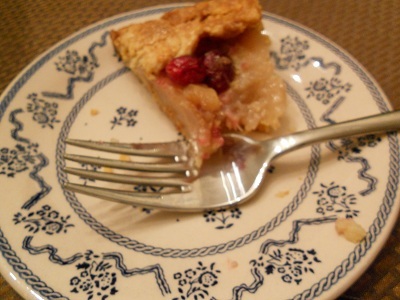 He replied: “My guess is that the baking soda step is a quick way of hydrating and softening the fruit, and probably turns the date bits into mush, which would help moisten the cake more than discrete pieces.” McGee also thought the baking soda would help make the cake brown, and indeed, as Hesser puts it, “the cake emerges from the oven dark and tawny.” And I can report that it smelled even better than it looked; at one point the scent of the loaf baking in the oven literally stopped me in my tracks. Baking Notes: I’ve been experimenting with flours lately, and the loaf I sent to Mir’s parents was made with white whole wheat flour. I was a little nervous it would be too dry, but the feedback I’ve received has been very positive. The flour choice is entirely up to you. Heat the oven to 350 degrees. Butter a 9x5x3-inch loaf pan. Line the bottom with a rectangle of wax paper. Butter the rectangle and sprinkle with flour; shake out the excess flour. Put the dates and raisins in a medium bowl. Dissolve the baking soda in the boiling water and pour it over the date mixture. Cream together the butter and sugar in a large bowl. Beat in the vanilla and egg. Add the flour and mix well. Add the date mixture, including the liquid. Add the walnuts. Pour the mixture into the prepared pan and smooth the top. Place in the oven and bake for 50 to 70 minutes, or until the top of the cake is dark brown and a knife inserted in the center comes out clean. Let cool for about 3 to 5 minutes, then unmold onto a rack, remove the paper, and let cool. My cousin Mark, who is best described as tall, dark, handsome and phenomenally successful, is also the world’s luckiest vegan. I say this based solely on the fact that his mother, Aunt Sydney, is the best cook I know, and she makes sure that his belly is always happy and full when he’s home for a visit. Whether it’s a bowl of fluffy quinoa tabouli for Pesach, or a jar of pickled beets, he is always well-sated. Aunt Sydney lives only a few blocks from my parents, so when we are all home for the holidays, like we were a few weeks back for Rosh Hashana, the cousins, nieces, nephews, spouses and grandchildren all gather at Sydney’s for an afternoon visit. We try to catch up as best we can. Sometimes there’s plum cake; this year there was stellar mandelbroit. The visit always begins with Sydney asking what Mom served, and us clamoring for her menu. I actually didn’t hear the full details of her menu on this last visit (I was distracted by the mandelbroit – it was that good), but Miriam, Syl’s wife, reported back to me about one of the vegan dishes she’d served. I honest-to-goodness gasped when I heard about the pan of butternut squash, leeks, sage and grapes, and may have even started to moan when I began to imagine what it must have tasted like. 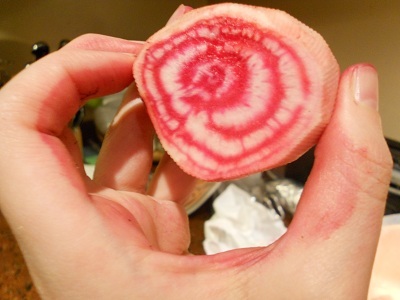 It sounded like pure autumn to me, a perfect harvest dish, which meant that it would be on my Sukkot table. Sukkot means, roughly, Feast of Booths, because the Children of Israel were commanded to spend the days of the holiday eating all their meals in a temporary structure, called a sukkah, to remind us of the 40 years in the desert. (Some people also sleep in their sukkahs, although I’ve never done it.) We also have some rituals involving a lulav (a palm branch) and an etrog (a citron), with a few pieces of myrtle and willow leaves tucked in between. But yes, Sukkot is a harvest holiday, and nearly everything in this dish came in last week’s CSA. When Rich saw me take the dish out of the oven, he made two observations: that it looked like fruit salad at first glance, and that it looked like a Thanksgiving dish to him. Yup, I said, that’s exactly right. It is a Thanksgiving dish. Aunt Sydney didn’t actually give me a recipe for this dish, but I guessed it in the same way that I guessed how to make her sweet potato and cilantro soup. I’ve taken to waking up earlier than Rich on the weekends, so I had actually cleaned the butternut squash earlier in the day making this a pretty quick dish to put together. 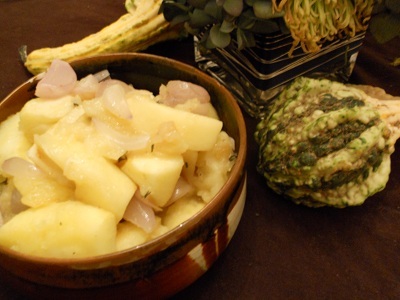 Using a sturdy peeler, I simply peeled the squash, cut it in a half at its waistline, sliced those pieces in thirds, scraped out the seeds from its bulb, then cut those into thirds, or approximately two inch cubes. 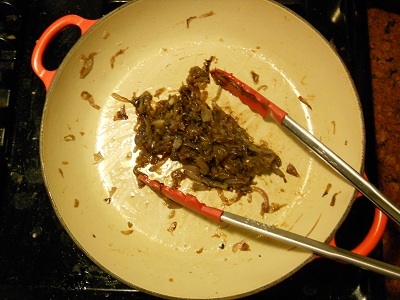 For the leek, I chopped off the top, peeled away its stiff, dark green outer layers until I got to very pale green part, sliced the leek in half vertically, and ran the stalks under running water and wiped out any dirt stuck in its crevices. To make certain that the leeks wouldn’t burn in a hot oven, I kept those pieces and their layers altogether in rather large pieces, about 2 inches. I intentionally photographed the pieces of leeks so you could see for yourself. Preheat oven to 450. If you didn’t wake up earlier in the day to clean a butternut squash, my advice is to preheat the oven before you prep any of the vegetables. In a large bowl, toss together the squash, leek, sage, olive oil and salt. Place all ingredients into a roasting pan with sides or medium-sized casserole dish, and cover tightly with foil. Place into the hot oven for approximately 30 minute. At the end of 30 minutes, remove the foil, and give everything a stir. Things should have softened very nicely by now. Remove the pan from the oven and add the washed grapes and give everything a stir. Place the casserole dish, uncovered, back into the oven for approximately 15 minutes more. Your goal at this point is to soften the grapes. In 15 minutes time, check on the pan. If everything is softened, and perhaps a little bit browned, remove from the oven, and serve. 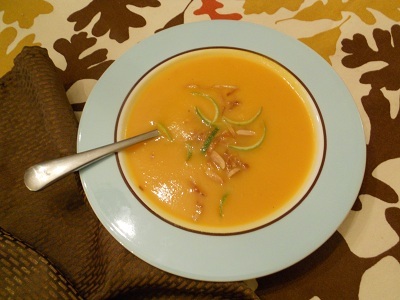 If you’re interested in the recipe for this butternut squash soup with ginger and lime, please check out JewishBoston.com for my review of The Complete International Jewish Cookbook by Evelyn Rose. If you believe that fancy, complicated desserts are what bakeries were invented for, carry on, nothing to see here. However, if you love days-long baking projects which result in the most extraordinary of desserts, guaranteed to elicit oohs and ahs around the Thanksgiving table, continue reading, because, boy, oh boy, do I have a recipe for you! 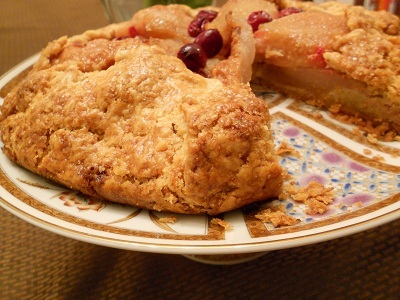 Seriously, the making of this dessert, from Joanne Chang’s flour cookbook, falls into the “redonkulous” category. The book’s subtitle “Spectacular Recipes from Boston’s Flour Bakery + Café” is a completely accurate description. If you want to impress your in-laws, your boss or just plain love a challenge, this is it. 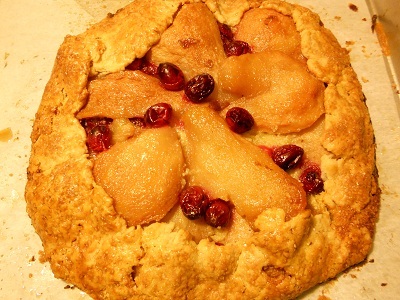 Rich and I baked this roasted pear and cranberry crostata last January during a blizzard. We figured we weren’t going anywhere and I had some extra pears lying around from a chutney project. It took an entire day to prepare. 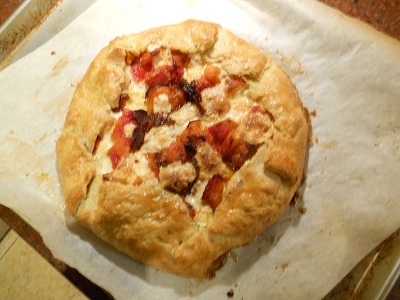 It’s basically the opposite of the idiot-proof Jacques Pepin apple gallete recipe that takes 15 seconds to prepare. Hindsight is 20/20, and if I was to do it again, I would prep each piece of this dessert one step at a time over a three day period. It’s much more manageable that way. And don’t worry if you start on this project and soon realize you’re really not in the mood to take it all the way through. The pate brisée can be refrigerated for up to four days, and frozen for up to a month. 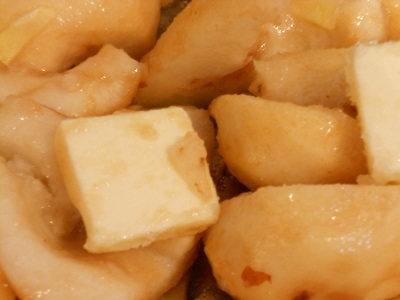 I think the roasted pears, tossed with ginger, butter and sugar, makes a scrumptious dessert on its own. Or over ice cream – it’s up to you, really. And the frangipane, well, you can just spoon that right into your mouth if you like. Position a rack in the center oven, and heat the oven to 400 degrees F. Line a baking sheet with parchment paper. Remove the dough from the refrigerator. 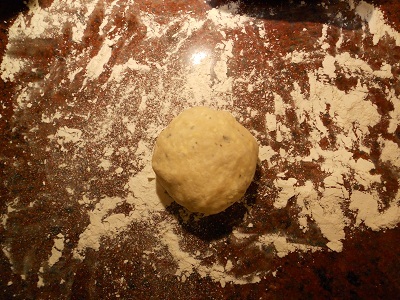 On a well-floured work surface, roll out the dough into a circle about 12 inches in diameter and ¼ inch thick. Place the dough circle in the prepared baking sheet. 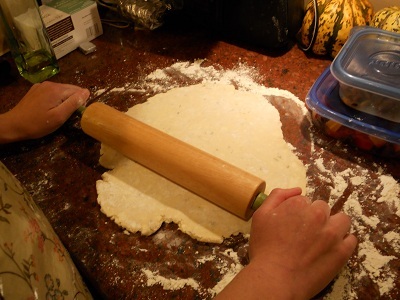 Using the back of a spoon or a small rubber spatula, spread the frangipane in the middle of the dough round in a circle about 9 inches in diameter, leaving a 3-inch border uncovered. Place about 8 pear halves, cut-side down, in a circle in a single layer on the top of the frangipane, lining them up with the edge of the frangipane and with the stem ends pointing toward the middle. Place 1 or 2 pear halves in the center to cover the frangipane circle completely. Sprinkle ¾ cup (75 grams) of the cranberries evenly on top of the pears. Top the first layer of pears with a second layer of pears, using about 7 halves and reserving 1 pear half, arranging them in a smaller concentric circle. 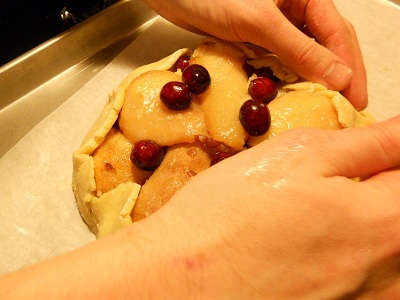 Sprinkle the remaining ¼ cup (25) grams of cranberries evenly on top of the second layer of pears. Position the rack in the center of the oven, and heat the oven to 350 degrees F.
Brush the pleated pastry with the beaten egg, then sprinkle evenly with the sanding sugar. Bake for about 1 hour and 20 minutes, or until the pleats are golden brown. Make sure all of the folds are evenly browned, so there are no chewy underbaked bits of dough in the finished crostata. Let cool in the pan on a wire rack for at least 2 hours. Serve warm or at room temperature. 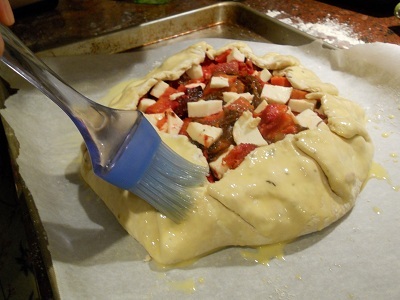 The crostata can be stored in an airtight container at room temperature for up to 2 days. Using a stand mixer fitted with the paddle attachment (or a handheld mixer), mix together the flour, sugar, and salt. Scatter the butter over the top and mix on low speed for about 45 seconds, or until the flour is no longer bright white and holds together when you clump it and pecan-size lumps of butter are visible throughout. In a small bowl, whisk together the egg yolk and milk until blended. Add to the flour-butter mixture all at once. Mix on low speed for about 30 seconds, or until the dough barely comes together. It will look really shaggy and more like a mess than a dough. 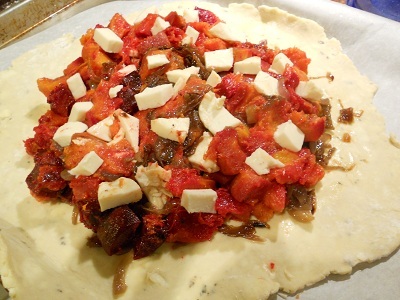 Dump the dough out onto an unfloured work surface and gather it together into a tight mound. 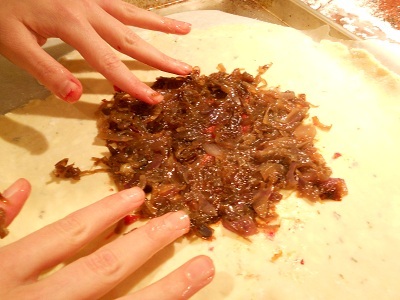 Using your palm and starting on one side of the mound, smear the dough bit by bit, starting at the top of the mound and then sliding your palm down the side and along the work surface, until most of the butter chunks are smeared into the dough and the dough comes together. Do this once or twice on each part of the dough, moving through the mound until the whole mess has been smeared into a cohesive dough with streaks of butter. If using whole almonds, grind them in a food processor as finely as possible without turning them into paste. Set aside. Using a stand mixer fitted with the paddle attachment (or hand-held mixer or wooden spoon), cream together the butter and sugar on medium speed for 1 to 2 minutes, or until light. Add the ground almonds or almond flour and beat on medium speed for 1 minute, or until thoroughly incorporated. Stop the mixer and scrape the bottom and sides of the bowl. On low speed, beat in the egg. Add the all-purpose flour, vanilla, and salt and mix until combined. You should have about 1 cup. Use immediately, or store in an airtight container in the refrigerator for up to 1 week, then let sit for a few hours at room temperature before using. Or, freeze in an airtight container for up to 3 weeks, then thaw it in the refrigerator before using. This past Rosh Hashana, with me in mind, my mother picked up a container of halvah from the new Turkish market near her house. The sweet sesame candy was studded with green pistachios the same color as its plastic lid. She left it on the island counter in the kitchen, which my uncle and I took as the go-ahead to stand there, spoons in hand, and dig away at the candy. We passed it back and forth like we were college students sharing some sort of contraband. My mom offered the two of us – her older brother and her youngest daughter – knives and plates. Oh no, we said, waving her away, don’t worry about us, we’re all set. Looking back, it’s probably not a best practice to eat directly from a container, be it halvah, ice cream, or even bags of carrots. But there’s something about the warm taste of sesame that always draws me in. Remember this addictive dressing? I rest my case. This recipe I have here for a tahini and roasted cauliflower dip is my penitence for shoveling halvah into my mouth for two days straight. 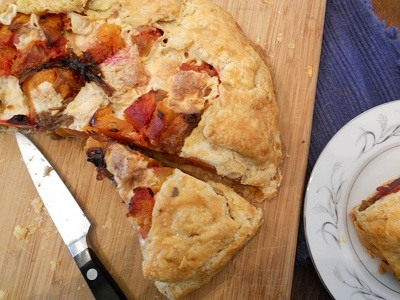 A good friend of mine actually requested this recipe to be one of the first that I shared on this blog, but I kept on forgetting to photograph it before I devoured the entire bowlful. I found it in a Food & Wine from a few years back; I tend to kick up the amount of ginger and ground coriander the original recipe calls for. I never seem to have fresh cilantro around when I’ve made it, but I’m sure it tastes very good in it. This dish doesn’t have to be served right away, and can be stuck in the fridge for a day or two. It warms up beautifully in the microwave. It should be noted that a serving of tahini has something like 18 grams of fat in it. But it’s mixed with cauliflower, so how unhealthy could it be? Don’t answer that. “It was like hundreds of gunshots.” That’s how one family friend described the sound of tree branches snapping and falling to the ground last Saturday evening. Western Massachusetts’ best asset, the foliage that people travel from around the world to see, proved to be its undoing during this very early Nor’easter. My little town, Longmeadow, was hit with 12 inches of snow, which fell onto trees still wearing their autumn finest. The combined weight of snow and leaves proved too much for the branches, which took out power lines as they crashed down. Most of the town has been without power since Saturday night. My parents, who had no electricity or heat, were our houseguests until today, when they got word that their power was restored. One friend from high school reported that her parents said it will be 100 years for our town to once again look like the town we grew up in. A century is a long time, although it’s doable for my town. Settled in 1644, we still celebrate an annual May festival on the town green, a long strip of grass on the outskirts of town that farmers would take their cattle out to pasture on. Lining the green are colonial houses, marked with stars to indicate their historic status. It is believed that John Chapman, better known as Johnny Appleseed, once lived in one of those houses. His myth continues, even if many of his trees do not. In just a few weeks, it will be my 15 year high school reunion. I’m a little nervous to return to see a town so different than the one I left. This simple recipe is from one of our favorite cooking shows on PBS: Caprial & John’s Kitchen. It’s not just the recipes in the show, but the chemistry this real-life married couple has on screen. Well, calling it chemistry isn’t exactly accurate; it’s more like watching a married couple who have to work, cook, and go home together. There’s a lot of correcting by Caprial to anything John does or says. Example: John will suggest a shortcut to the viewer, which Caprial will promptly veto as a terrible idea. We showed an episode to our friend Ben, a clinical psychologist, and he dubbed them the passive-aggressive chefs. But judging by this recipe, it’s working for them. Place a metal pan in the oven and preheat it to 500. Toss apples, shallots, thyme, olive oil and salt in a bowl. Carefully pour the ingredients into the piping hot pan – it will sizzle – and close the oven door. After 5 minutes, give them a stir with a wooden spoon. Close the door, and check them again in another five minutes and give a stir. Follow up one more time, for a total of 15 cooking minutes. 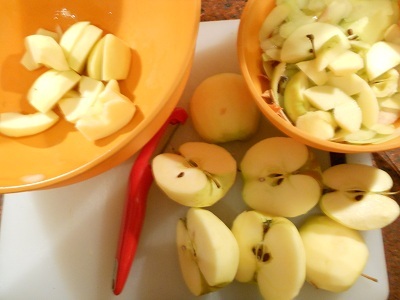 The apples will have softened, many will have completely lost their shape and integrity, making an herbed, savory apple dish. This will make a wonderful side dish for your Thanksgiving table. UPDATE: I sauteed these leftovers with some frozen pierogies last night for dinner and it was really terrific.